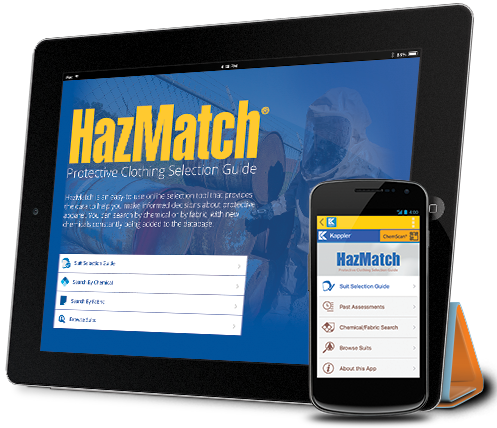 HazMatch® is an easy-to-use protective apparel selection tool from Kappler that allows a user to choose an appropriate safety garment based on a specific chemical hazard and the exposure scenario. HazMatch also allows a user to save search results to document a Hazard Assessment procedure, which satisfies OSHA requirements for this important procedure. HazMatch is ideal for emergency responders, industrial hygienists, safety managers or other professionals dealing with hazardous materials. The app contains a database of tested chemicals, which the user can search by either chemical name or CAS number. Once a chemical is selected, a user completes a short questionnaire on the hazard situation (such as level and length of exposure) and HazMatch will recommend a protective garment that matches the exposure criteria. In the event that multiple protective garments are suitable for the chemical and hazard scenario, all of the available choices will be listed with the least expensive garment appearing first. Each recommended garment recommendation includes detailed information about that particular style. HazMatch also may be searched by the different protective fabrics Kappler offers. This search mode provides a list of tested chemicals for a specific fabric and the holdout time for each chemical. All of the chemical data in HazMatch is based on third-party testing, with the database updated regularly with new chemicals.